At Environmental Products & Services of Vermont, Inc. (EPS), we put an emphasis on the health and safety of our employees, and safety on our job sites. EPS is one of a few selected companies approved to provide HAZWOPER Training for U.S. Environmental Protection Agency (EPA) employees. Our employees are health and safety trained in accordance with OSHA 29 CFR 1910.120. We also provide training to individuals who want to change careers, as well as our customers who need to insure that their employees maintain current certification. 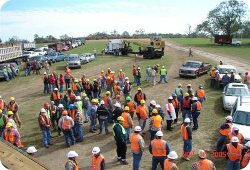 Our training department can tailor class size, location and scheduling to accommodate your specific needs at your site or ours.